Are you in the market for shadow boxes for your home or your business? We have a large selection of display accessories to meet the needs of any user. 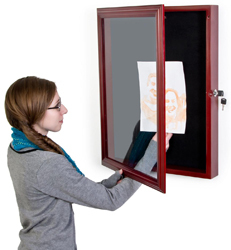 Wooden shadow boxes are the ideal way to keep valuables secure, damage-free and in pristine condition. We offer a huge variety of sizes ranging from 6.8" x 14.8" to 37" x 49"! Wooden fixtures are made from durable, carefully crafted materials. These frames provide an extra layer of protection over plastic or acrylic while also adding a sense of style and grace. 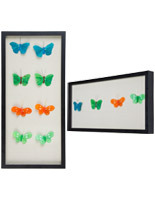 The shadow boxes, also known as wall collectible cases, are ideal for use in the home or in public. Use the displays to showcase your favorite memorabilia from sports teams, military mementos like medals and flags or to feature artwork and crafts. The clear, glass front allows for your items to be displayed without obstruction. The award cases make the perfect frame for such a large variety of contents that it is easy to see how these displays could be used in any setting. The locking feature on some of the models we sell ensures that your valuables will be protected. Each wall showcase has a decorative design that will complement not only your décor but the items within as well. Where can wall collectible cases be used? At home use is popular because these wooden shadow boxes provide a unique space to display your favorite collectibles and mementoes! Offices and business settings can use the frames to showcase awards, certificates of recognition or diplomas for the people who work within the company. Restaurants and cafes can utilize the wood displays to hold menus, drink specials or awards and newspaper articles reviewing the establishment. Galleries and museums may want to use these craft boxes to display various feature art work such as paintings, photographs or drawings. What types of styles are available for these wall collectible cases? 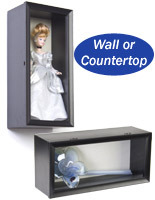 Black units with hinged doors are available for small collectibles like dolls, sports cards and crafts. Each shadow model has a glass front that allows the contents to be displayed in an unobstructed fashion. Some boxes come with a cherry or lighter finish making it easy to choose the style that best fits your home or business. The wall collectible cases we offer are designed to fit your every display need. Choose from a variety of sizes to make the most of the space you have available. Only have a small shelf? No problem! We offer smaller fixtures for single items or smaller contents. Need something large enough to display a sports jersey, a plaque or a military flag? We have extra-large sizes available as well. Each of the displays come with wall mounting brackets to make hanging them fast and easy. However, certain models can be placed on shelves, tables or counters. These units make the perfect award frames for a child's room or any room in your home. Keep your valuables protected behind the glass fronts. The swinging doors make it simple to change out the contents of your wall showcases. Make your displays visible to your guests, patrons or patients. 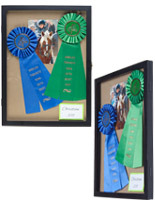 Use these models to display diplomas, medals, awards, crafts, artwork or any printed material. The depth of some of the cases allows you to place 3D objects within the units for an eye-catching and impressive display. Some of the wall showcases come with locking fronts to secure your contents. The locking cabinets come with two small keys to give access to the items when you need to update or change them. The lock keeps unwanted persons from touching or tampering with valuable collectibles. In addition to the lock and key, some styles offer a tempered glass front. The tempered glass is thicker and more durable than traditional glass and offers a more stable environment for your collections. Keep the contents dust and damage-free within these displays!